NIWA announced global pricing and availability details for PAYGO TVs in 32″, 24″, 19″ and 16″ size. The highly-acclaimed PAYGO TVs from NIWA are now available for pre-order with deliveries expected in March. NIWA Solar TVs deliver a premium viewing experience with superior picture quality, triple tuner and lowest power consumption available. The TVs support digital satellite, digital terrestrial and analogue terrestrial signal reception. With only 13W power consumption the 32″ and 24″ are most popular models – best matching 50W, 40W solar systems for long hours of TV experience. The new PAYGO features bring our customer’s PAYGO credit payment experience to the next level. 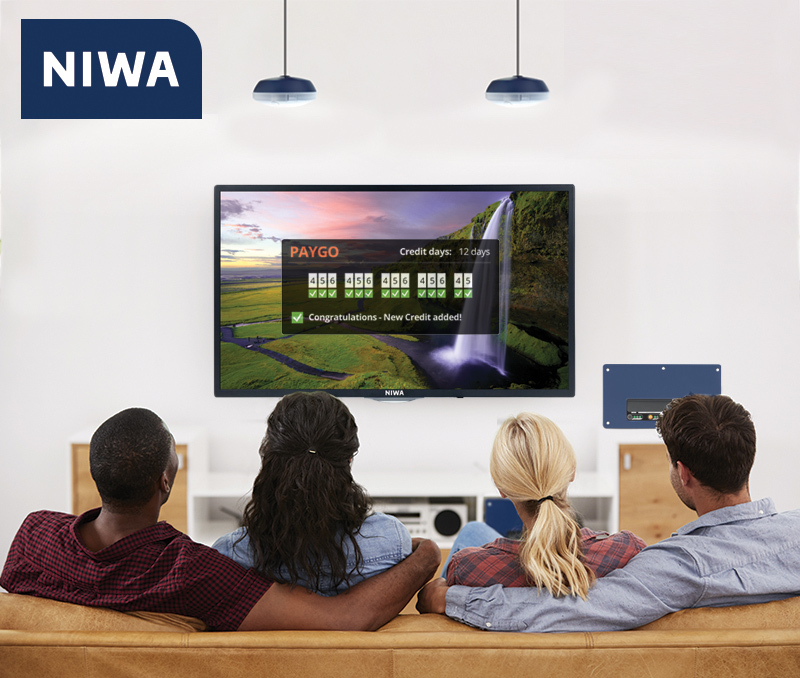 NIWA’s PAYGO TV range is fully protected to run only when PAYGO credit is paid. 100% locked to protect your and your MFI partners investment in the field. But NIWA brought the PAYGO integration even for the end customer to the next level: Credit days remaining are conveniently visible in realtime on the TV screen – so it is easy to keep an eye on progress of the payment plan. As an alternative PAYGO code can be entered via TV screen and TV remote control as well which makes it very convenient for the whole family to enter payments. NIWA Solar is a leading manufacturer of home solar solutions for the consumer market. With its innovative solar systems, solar appliances, solar lanterns and unique production setup NIWA Solar is uniquely positioned to be the leading consumer solar company in the world. Click HERE to join the NIWA Newsletter.